My first trip to Lake Erie was in the fall of 1999, when I was invited by one of the areas greatest walleye anglers, Rick LaCourse, to do a little night fishing out of Huron, OH. It was a balmy December night, with a light 5mph South wind, and the temperature outside was 60 degrees. There was a full moon lighting up a clear sky, that shimmered on the calm water, making it look like it was made up of diamonds. The fishing was incredible, and the size of the fish astounded me at the time. I’m originally from Wisconsin, where the walleye fishing is also very good, but it was nothing like what I experienced here for the first time at Lake Erie. That night, we trolled with crankbaits behind Off Shore Tackle inline planer boards at slow speeds. The boards were lit up with glow sticks attached to the flags, so when a fish hit, it looked like a shooting star going back in the water. Seeing a large walleye, with a mouth large enough to stuff a grapefruit in it, coming up behind the boat elevated my excitement to the next level. I was hooked! I knew then that Lake Erie was the place I wanted to fish forever. A couple years later, I had had enough dreaming and made the move from Wisconsin to Ohio. I had quit my job as a color correction specialist in the pre-press dept of Reiman Publications, sold my house, and moved to Ohio to pursuit of a career in the fishing industry. With much work and dedication, I have achieved that dream by first fishing for many years on the Pro/Am walleye circuits across the country, as a journalist covering the tournaments for Walleye Central, and for the past 8 years as a guide on the Lake I love. Many of my sponsors have been with me through this entire adventure and are the ones responsible for making all my dreams possible. The first spring that I fished Lake Erie with Rick, he told me that they start by “ice fishing” out of the boat and then, by jigging with ice fishing baits. Then, as the water warms, they would start jigging with regular jigs, and then on to trolling with crankbaits. This made me scratch my head, because it confused me that we could troll in the fall when the water was almost the same temperature, but we couldn’t troll in the spring when the ice went out. It didn’t make sense to me, so I asked him if we could try trolling instead of ice fishing out of the boat. Being the kind of guy, he was, he indulged me, and we put the crankbaits out. Now, I’m not saying that I’m the first one to try this, because I’m probably not. I’m just saying that in the circle I was in at the time, it wasn’t done that way. As it turned out, it was successful, and we never had to ice fish out of the boat again, which is something that made me very happy! 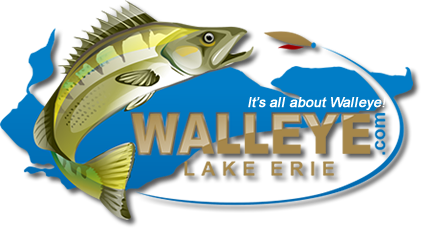 In the spring, the walleye spawn in the Western Basin of the lake, where there are plenty of reef complexes and rivers. This happens in late March and April as the water warms after a long winter. The opportunity to catch trophy sized pre-spawn and post-spawn fish is at its highest during this time, and several tactics to catch them can be used. For those that like to jig the reefs, a 3/8oz to 1oz hair jigs (best used with stinger hooks) are often tipped with Emerald Shiners, or soft plastics, but can also be successfully used without bait or plastics. Color can matter, so having an assortment of colors available to you will better your chances of catching fish. Popular colors are Purple, Chartreuse, Orange, Pink, Blue, Green, and Black. For those who like to troll, most anglers will start out with some popular proven crankbaits like the Smithwick Perfect 10 and Top 20’s (very similar to their earlier “Rogue” baits), Rapala Deep Husky Jerks (size 12 and 14), Bandits, Bomber Long A’s, Berkley Flicker Minnows (sizes 9 and 11) and both the shallow and deep diving Reef Runner baits. I know other baits get used, and the list could be extended, but these are the baits I have used over the years and are the ones that I put in my boat each season. I was taught that when the water is in the high 30’s to low 40’s, the fish are sluggish, so trolling very slow is key. A speed of .8 to 1.0 has always been recommended. However, that’s not always the case. For instance, over the years, I would hear of someone trolling at much faster speeds, at the same time that I was trolling slow, and they were catching fish too. So, keeping an open mind and trying new things can make you a better angler and increase your catch rate. If you’re marking fish, and not catching for some reason, it only takes a few minutes to try a different speed. Get radical and try a fast speed like 1.5 to 2.0mph, to see if it triggers any response from the finny critters below. Sometimes, I’ll use the “Rabbit” feature on my Minn-Kota trolling motor to speed up the baits, and then turn it off again, to slow it down. My thinking is, it gives the fish something to react to and can sometimes make the difference between a slow bite and a fast bite. Changing colors often, until one stands out from the rest is another tactic I use while trolling. Sure, I have my favorites that I start out with, but if they are not in the mood for those colors, I have a plethora of other colors to try until I find the ones, they like best. It’s a lot more work, but it’s worth it when the bite becomes steadier. Boat handling is another tactic I use to improve the catch rate. To help find the right speed, I will make turns during my trolling passes to determine if they want the baits faster or slower. When you make a turn using inline boards, the boards on the outside of the turn will be moving much faster through the water than the boards on the inside of the turn. If a fish hits on one side over the other, and it’s repeated so I know it wasn’t a fluke, I will slow down or speed up to give them what they desire. The most actively feeding fish will be higher in the water, and not always seen on the sonar picture, so I always like to have at least one bait up in the top 10 foot of the water column, just in case. It’s not uncommon to end up having all the baits running that high during the spring. The walleye I see on my Humminbird’s sonar screen, that sit close to the bottom out on the flats, are usually in a negative mood, and will not usually eat a bait that is trolled by them. The walleye up on the reef complexes, that sit close to the bottom are fair game for the anglers who prefer to jig though. While I prefer the trolling game, I will take customers out to the reefs to do some jigging if they want to. Sometimes, it’s fun to feel that bite at the end of the line and feel the weight of the fish as soon as it hits. I must say though, that a jigging trip is much more fun for my customers than it is for me, because I don’t get to fish when we are jigging. I just man the net for them. It’s not that I don’t know how to jig, or that I’m not good at it… I just wouldn’t want to chance catching a big one right out from under them and steal that opportunity for one of them to catch it. If the chance of catching a trophy walleye is on your bucket list, then I highly recommend a trip to Lake Erie’s Western Basin from March through the end of May. June and July have some tremendous fishing too, but as the water warms the bigger fish that migrated from the east end of the lake, have already headed back to their summer haunts by then. That’s not to say, that some bigger fish do not stay in this area, because it’s not uncommon to find a trophy walleye hanging around from time to time during the summer. But, if table fare is your desire, then June thru September is the time to come here. The catching can be very fast during these months, when conditions are right, and a ton of fun! Come fall, until ice up, the big fish move back from the east and we start the process all over again. If Perch fishing is more to your liking, then I recommend looking at August thru ice up for limits of the green and gold treasures. Now is the time to book your Spring Lake Erie fishing Charter for a chance at a trophy walleye, so don’t procrastinate, or you might be left wishing you had reserved your date(s) earlier! Last edited by Capt Juls; 01-15-2019 at 06:08 PM. As always nice reading young lady, may your fishing adventure continue and your coming season keep us informed plus your pics also. I love hearing and reading these type of stories. I got the walleye bug bad when I was 8. for as far back as I can remember, i was always out fishing with dad and papa almost every weekend that mother nature let us out. Back then mom and dad had a trailer at harbor winds and papa had a 24 ft hardtop thompson weekender. We only casted, not many trolling and we never made the long run to jig. So walleye didn't turn on well till mid may normally and by late July it slowed down. My birthday is in early August and when I was 8 I got my own rod and reel as a present. I always used whatever combo was left to use, but this was new and bought for me. So needless to say I bugged the ever living hell out of dad to take me out. Course he said not today but I kept on like only an 8 y/o overly excited boy can. Finially to shut me up out we went, turn east out of east harbor to out in front of lakeside. Now as many know August can be a tough time to cast for walleye. but thrid cast out, I tied into something big. I couldnt even crank it, it took all i had to hold the pole and grasp the crank arm and turn my wrist as you would in closing a jar......1/2 turn at a time, it took all i had but I got her in and dad netted my first fish ohio at at nice 27". i was so excited I'm surprised i didnt just jump right off the boat. After all the pictures high fives and hugs, i snaked a new crawler on and let my erie dearie fling out the back corner again. I didnt get more than 5 or 6 cranks into the retreave and slammed into another fish. this one pulled me flat against the transom. as much as my heart was into it my already tired arms and hands just couldnt make any headway on this fish. I remember seeing my little fingers turning my blue trying to get even a crank on this fish. I had to hand it to dad and I remember not feeling like such or weakling when my dad struggled to bring the fish in. but when he did we were rewarded with a nice 29" walleye. neither were big fat hogs but nice long streamline fish. both still hang on mom and dads walk at their house. from that day on I had the bug to walleye fish. I learned that day you never what the next cast brings. 31 years later I still get the feeling everytime I feel or see a rod bend over. I'm thankful that most of those year minus the few I went to college and was early on in my working career, I always had many trips out trying to get the next big one. luckily I met a beautiful gal that I'm now married to who's family spent alot of weekends at lake erie so it was only natural to get our own place and boat. Hopefully I can get to give my kids a few memories like this of our lake we love and it will be as big as part of their lifes and theirs children's life. even if not fishing, it's hard to beat a day out on the water. more than once we have loaded up the boat set out across the lake and 8 hrs later cam back and never stopped anywhere.......just enjoyed the sun, wind. freedom. and sounds of being out there that the lake gives. I love reading everyone's stories on here! There are quite a few people in my life that don't understand how I can spend so much time on the water. It is comforting to know that others are as freakishly in love with the water and fishing as I am! I love your passion for the sport and really enjoy spending time and learning on your boat. Quite a story,to catch a 27" and a 29" walleye on consecutive casts when you were 8yrs old. You also did it in August in front of Lakeside.Are you sure they were walleye.....maybe they were sheephead and your fishing crew just told you they were walleye to make you happy? always a comedian in the crowd isn't there. lol I was 8. not plumb dumb. very much aware of the difference even back then. I still have the fish Ohio pin from where we went and had them officially measured as you used to have to do. they both still hang on the down stairs wall at mom and dads house and I still sport the scar from where its gill plate sliced me as i was holding it for the picture. No worries! I invite all to share their experiences here. It makes for some good reading.